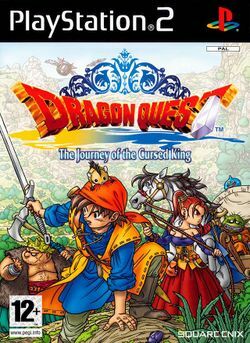 Dragon Quest VIII: Journey of the Cursed King, known in Europe as Dragon Quest: The Journey of the Cursed King and in Japan as Dragon Quest VIII: Sora to Umi to Daichi to Norowareshi Himegimi (lit. "Dragon Quest VIII: The Sky, the Ocean, the Earth, and the Cursed Princess"), is a role-playing game developed by Level-5 and published by Square Enix for the PlayStation 2 home video game console. It is the eighth installment of the popular Dragon Quest series (formerly known as the Dragon Warrior series). It is the first English version of a Dragon Quest game to drop the Dragon Warrior title. Dragon Quest VIII uses cel-shading textures for the characters and scenery, and unlike the previous installments battles are not limited to a first person perspective, instead showing all characters in the player's party. It has enjoyed much success since its release, particularly in Japan where it sold more than 3 million copies in its first week on sale. A survey conducted in 2006 by the magazine Famitsu earned the game the #4 spot as the best video game of all time after Final Fantasy X, Final Fantasy VII and Dragon Quest III. The game received a remake on the Nintendo 3DS on August 27, 2015 in Japan, and it was announced that the game would be released in North America and Europe for the Nintendo 3DS in 2017. This page was last edited on 19 February 2017, at 05:21.